Every home should have some basic safe security. It’s a great place to keep valuables safe and gives you peace of mind. The new Multifile MF-GDF series is an ideal option for home owners and offers great fire protection. 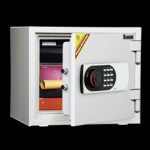 Now with a Keyless electronic lock and keypad, the fire insulation filled door and body offer up to 60 minutes fire protection, plenty of time to gather your possessions. The Pre-drilled anchoring holes allow this safe to be anchored to a solid surface. Plenty of room on the inside also, with the addition of adjustable shelves for storing various size items.